A smaller tablet from Amazon with a 6.9-inch screen and running on the Fire OS 5.6 operating system at time of test. The Amazon Appstore is included for downloading additional apps. Tested with 16GB of storage. 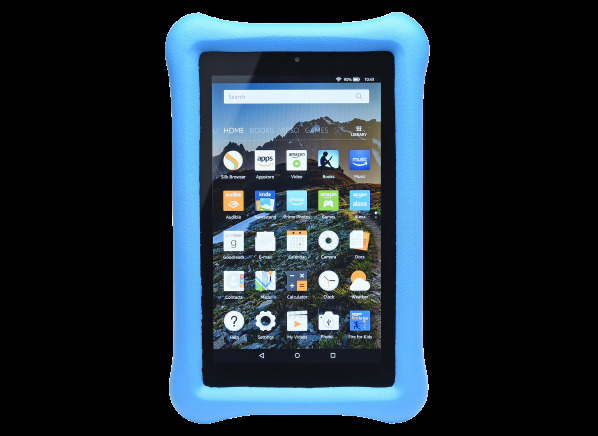 The Amazon Fire Kids Edition (16GB) is a smaller tablet with a 6.9-inch screen. It has a display resolution of 1024 x 600, and produces very coarse detail at 171 pixels per inch. The tablet has a 1.3GHz Quad-core processor and ran on the Fire OS 5.6 operating system at time of testing. It has 1GB memory and is available with 16GB storage. You can add a micro-SD memory card for more storage. You can connect to the internet using 802.11ac WiFi. It has Bluetooth and you can mount a flash drive. It has a 0.3-megapixel webcam and a 1.5-megapixel camera. The Amazon Fire Kids Edition (16GB) measures 8.6 inches long by 5.4 inches wide by 0 inches thick. Without a keyboard, it weighs 0.8 lbs. Results in the following chart are gathered from Consumer Reports’ 2018 Winter Survey of 55,713 tablets, owned by members who purchased a new device between 2013 and 2018. Our predicted reliability ratings are based on a statistical model that estimates problem rates within the first 3 years of ownership, for tablets that are not covered by an extended warranty or service contract. We also adjust for the median number of hours of use per week. The median in our survey was 14 hours per week. Higher ratings are indicative of better reliability. Brands receiving a red or orange rating cannot be recommended by CR at this time. Our owner satisfaction ratings are based on the proportion of members who are extremely likely to recommend their tablet to friends and family. WiFi type WiFi type The type of built-in 802.11 wireless networking supported. Tablets with 802.11n also support 802.11g routers. Some models with 802.11n also support the 5GHz "high band," a standard suitable for apartments and other crowded areas. Mobile Type Mobile Type Highest level cellular network the tablet can connect to using a carrier's data plan. Memory-card reader Memory-card reader A slot for a standard memory card (usually a micro-SD) to expand storage or transfer files. Camera Camera An outward-facing camera for shooting photos or video recordings. Webcam Webcam An inward-facing camera for video chat or selfies. GPS GPS Can receive satellite data for precise navigation. Capacitive touchscreen Capacitive touchscreen A capacitive touchscreen requires less pressure and is more precise than the resistive type, but cannot sense gloved fingers. Internal storage (GB) Internal storage Storage for the operating system, downloaded apps and user content. Operating system (as tested) Operating system (as tested) The underlying program that runs the user interface and applications. Version is the installed OS at time of testing. Length (in.) Length The longest edge of the tablet measured in inches. Width (in.) Width The medium-sized edge of the tablet measured in inches. Depth (in.) Depth The shortest edge of the tablet measured in inches. Resolution Resolution The pixel dimensions of the screen, length by width. Combined with the screen size, this determines the pixel density, which is the true measure of the ability to display image detail. Pixel density Pixel density A measure of observable detail on the screen. Pixel density of about 300 pixels per inch or higher eliminates any detail loss due to screen resolution limitations if viewed about 10 inches away. Mobile data Mobile data Can use a cellular carrier's data plan to connect to the Internet. Camera MP Camera MP Megapixel resolution of the outward-facing camera. Camera: Video definition Camera: Video definition Largest height available to the outward-facing camera for recording video. 720 and above can display in HD; values below display in SD. Webcam MP Webcam MP Megapixel resolution of the user-facing webcam. Webcam: Video definition Webcam: Video definition Largest height available to the user-facing webcam for recording video. 720 and above can display in HD; values below display in SD.